Barry Lynock, one of Alvechurch’s most friendly and genial gentlemen, died unexpectedly in December after nine years of faithful service to this parish as the Alvechurch Parish Footpaths Warden. He was always found in his turquoise shorts and also wearing that infectious smile of his. Friends and colleagues described him as a trustworthy, humble and gentle man with “a true community spirit”. Alvechurch parish has at its heart the medieval village of Alvechurch with its pretty half-timbered houses, nestling in the valley surrounded by idyllic ridges and stretches of countryside. Considered the “gateway to the countryside”, it is crisscrossed by 28 miles or so of public Rights of Way (or footpaths as you may know them), which we have all come to love and appreciate. These paths have been maintained and cared for by the Alvechurch Village Society footpath maintenance group for more than 40 years now, and its volunteers have been keeping them open and in good condition by working for a few hours on alternate weekends from spring to autumn. The role of Alvechurch Parish Footpaths Warden aims to help facilitate the effective management of our public Rights of Way network by the use of local knowledge, and assistance in conjunction with and guidance of the resources of Worcestershire County Council. The footpaths group will carry on their work with a temporary committee organising this coming year’s programme, until a more permanent replacement warden can be found. Could this be you? The group would like to encourage new members, especially some of our younger residents and hopefully their parents as well. Unfortunately our members are getting older and volunteers are urgently needed to help out and keep the group going. If you can spare two hours every now and again on a Saturday morning during the warmer months of the year, we would appreciate you getting in touch. New skills in countryside practices can be learnt, from basic hedge and overgrowth maintenance to building bridges and stiles and erecting footpath way posts. All tools are provided and a helping hand shown in how to use them safely and carry out these enjoyable jobs. You may be one of the many people who use our parish footpaths and you may have met us when we have been out on Saturday mornings, trying to make sure the paths are well looked after and kept open for everyone. If you do happen to see one that needs our attention please let us know – you can even come along and help put it right if you’d like. You may have also seen our bridges down at The Meadows. When that big tree fell down and demolished the old bridge leading to the cricket club, our group came to rescue the Picnic in the Park by building a new (even better) one that saved the day. It’s not all about work, however. The group has developed into more of a social get-together, and we do stop at half-time for coffee, a chat and quite a few chocolate biscuits before resuming for the ‘’second half’’. All our group members look forward to spring when we can get out in the fresh air and start on our new list of countryside jobs. The public Rights of Way are ultimately the responsibility of Worcestershire County Council but their limited resources can’t keep up with all this general maintenance. 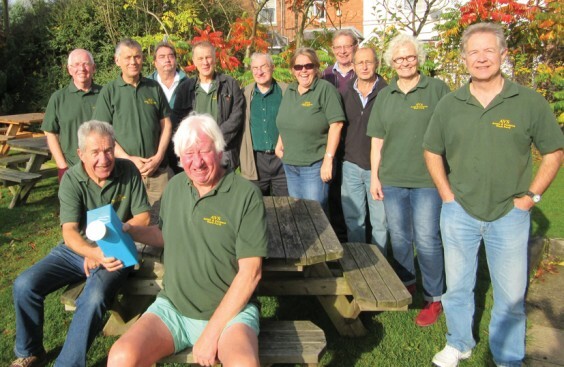 They do support our group by providing materials, as they see us as one of the few parishes in Worcestershire to have such an active group of community volunteers. We hope you agree that it’s most important that the Alvechurch footpath team survives, even more essential now that further local authority cut backs are due in the coming years. The county council even rewards us at the end of every year by contributing to our end-of-season celebration breakfast where we all meet up at the Weighbridge to mull over our season’s work and enjoy the fabulous full English breakfast that landlady Jayne provides. So, if you are one of the many people who enjoys walking our countryside footpaths, why not come along and help us keep them in good condition – we can promise you an enjoyable experience in the fresh air while helping your community. It’s free to join, and anyone who does so will not only find it enjoyable and make new friends but will also be giving something back to this great place where we all live. You can contact us by calling Adrian Smith on 0121 445 0481 or Ray Yarnell on 0121 445 5739 or leaving your details at the Parish Council offices at 16 The Square, Alvechurch. We would welcome anyone wanting to join our committee to help and get involved in the work we do throughout Alvechurch, Bordesley, Hopwood, Rowney Green and Weatheroak. We would particularly appreciate anyone who felt they could be our Treasurer. It’s not a lot of time or work involvement, but very worthwhile. If you are interested, please contact Ray Yarnell on 07931 328023. Above: Barry is presented with a bottle of wine by Ray Yarnell at the end-of-season breakfast” in October 2015.